No weakness I can find, a true audiophile bargain ! This amp deserves a hi-end quality sound set and good speakers. You need Hi-end speakers that are not deaf, like 86db or better. Controlled warm up but not long. I bought the primaluna because I wanted to get back into tubes & the price was right. I also needed an amp that had a 4 ohm output to match my 1.6 magnapans. Having been an audio enthusiast in the late 50's with McIntosh amps I was also looking for quality. The advertised engineering specs were impressive and found to be correct.The autobiasing a real plus. The wiring & board layout was clean. When I first hooked up the Primaluna I tried to see if I could hear any difference from my Panasonic 100w solidstate amp. The warmth of tubes that I remember was there and it made my Magnapans sound even better, especially in the lower range. & quality. 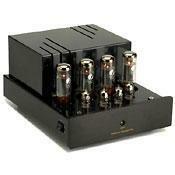 Any good tube amp must be used with quality speakers, not the small ones that come with the all in one minisystems. Each listening session seems to sound better & better! I won't cut into the usual "jargon" about soudstage, etc. It's simply musical. Whatever it's shortcomings, and I don't know of any, especially at it's price point, it is a piece of instrument that keeps me listening. It has something that many higher priced kits don't do...it keeps you emotionally glued. I have had numerous setups over my 30 plus years, and I am getting so much pleasure out of this amplifier. I can't recommend this product enough. The Primaluna Prologue Four does things very, very well. If you’re reading this, you’re probably already aware of its strengths and great value. So let’s cut to the chase- it’s a “ladies amp.” I don’t mean in the sense that it’s designed and built with female tastes in mind, though my wife and older daughter think it looks cool. The Primaluna Prologue Four does a mesmerizing job of conveying the beauty of the female voice. Take any reasonably recorded LP or CD, of any female vocalist performing any kind or music and hear what incredible music emerges. I don’t care who you pick- Nora Jones, Ella Fitzgerald, Jane Monheit, Dawn Upshaw, Marianna Prevetti, Linda Ronstadt- it simple doesn’t matter. This amp let’s the subtle nuances of the female voice come through your system in away that’s almost three-dimensional. She’s there, so is her band and the space in which she was recorded. And from there, the music flows. This is one gem of an amp, in spite of any shortcomings. In my system the bass is a bit heavy, but I can look past that given what the Prologue Four ultimately does. It’s only 35 watts, but my speakers are fairly efficient and my listening style rarely calls for volumes capable of leveling a small town. All in all, a great amp!